Legendary Luang Phu Suang (Tewada Len Din) – This Pra Pong Supan Benjapakee Top Five family amulet is made from Nuea Dam Prasat Khom Pan Pi (thousand year old Sacred Khmer temple earth and powders). In addition, the sacred powder includes Ya Wasana Jinda Manee, as do all the amulets from LP Suang which are made from Nuea Dam Prasat Khom Pan Pi. An extremely sought after amulet from the elusive Master of Ban Lalom, this was the first ever edition of amulets he ever made. The Legend of Luang Phu Suang Says that he lived for 500 Years, and that stories of villagers of various Generations all remember Luang Phu Suang being old and living in the middle of the rice paddy at Sri Saket. Made in 2519 BE and empowered by Luang Phu Suang for three days and nights. 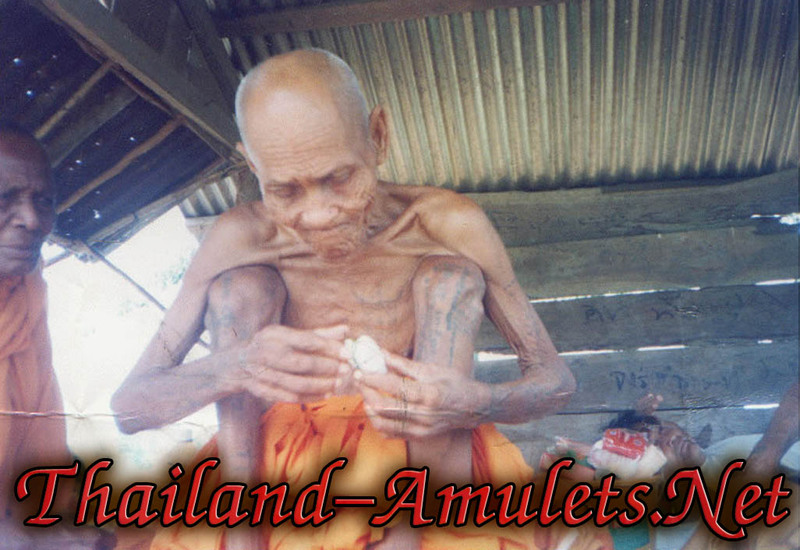 The amulets were then stored between 2540 and 2550 at Wat Sutat – blessed in many large Puttapisek empowerment ceremonies there repeatedly by many Great Monks who visited at Wat Sutat. This is a delicate and small size amulet suitable for Men Ladies or Children to wear and Bucha as a central amulet on a chain for a Lady, but can also be attached to a chain with a larger central amulet as one of the lateral embellishments on let us say, a three or five amulet chain if a Man. Comes with stainless steel fancy casing included in price.